Instead of £2,380.00. You save £119.00 due to the online discount . 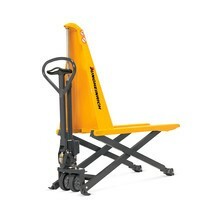 The electro-hydraulic Ameise® scissor lift pallet truck is a real all-rounder. 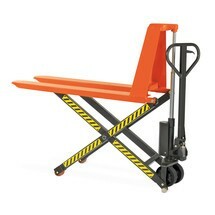 You can use it as a hand pallet truck, lift table, provisioning table or workbench. 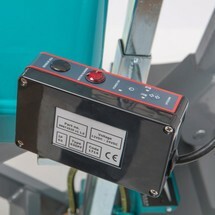 Thanks to the powerful lift motor, you can raise loads to an 800 mm lift height at the simple touch of a button. 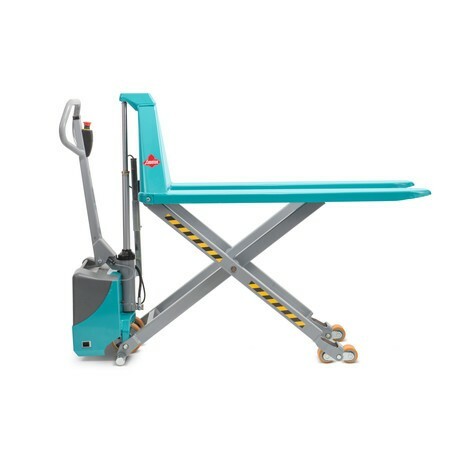 Rapid, effortless lifting and easy adjustment in the case of frequently changing working heights allow you to go about your tasks with utmost comfort. The electro-hydraulic Ameise® scissor lift pallet truck is an effective and flexible device that can be used to pick up and transport pallets as well as lift them to the correct working height. The electric scissor lift pallet truck is equipped with a 0.9 kW lift motor. This allows you to lift loads to the correct height at the touch of a button and lower them just as easily. 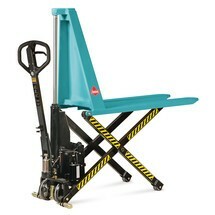 The scissor lift pallet truck can also be (retro)fitted with a position control function. The automatic position control maintains a set working height at a constant level and thereby ensures ergonomic working and greater efficiency throughout the entire loading and unloading process. The Ameise® scissor lift pallet truck is characterised by its user-friendliness and safe design. All operating functions are positioned centrally on the ergonomic tiller. The emergency disconnect switch is also located directly on the tiller handle. 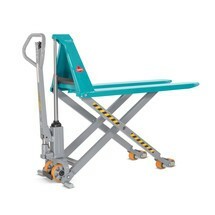 The scissor lift pallet truck can be moved up to a lift height of 400 mm. 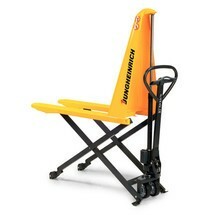 As of a lift height of 400 mm, side-mounted stabilisers secure the pallet truck and provide additional stability. 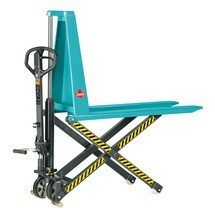 The tandem fork rollers in the scissor legs are secured with brakes. This prevents the truck from rolling away under heavy loads and eliminates the risk of tipping. The maintenance-free 70 Ah dry-cell battery is designed for industrial applications. Thanks to the internal charger, you can easily charge the battery at any standard 230 V socket. A steel frame protects the battery against impact and moisture. The robust construction and reliable telescopic cylinder guarantee a long service life and low maintenance costs. 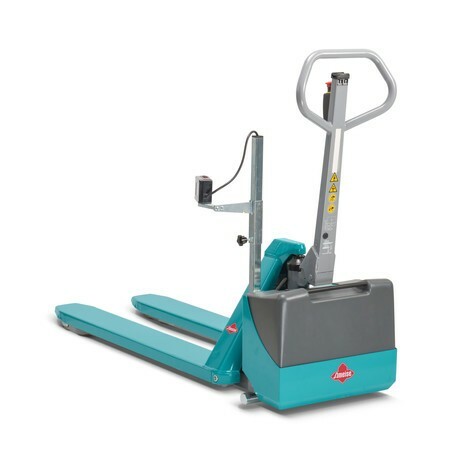 This makes the electric Ameise® scissor lift pallet truck ideal for continuous daily use. 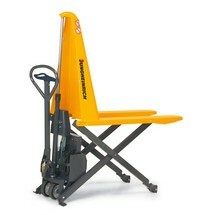 Benefit from enhanced workplace ergonomics with the electric Ameise® scissor lift pallet truck. The electro-hydraulic version is available from our shop in different fork lengths with optional automatic position control.